Partita In A Minor For Solo Flute, BWV 1013 composed by Johann Sebastian Bach (1685-1750). Edited by Hans-Peter Schmitz. For flute (unaccompanied). This edition: Stapled, Urtext edition. Stapled. Urtext der Neuen Mozart-Ausgabe. Baroque. Difficulty: medium. Flute solo book. Introductory text. BWV 1013. 11 pages. 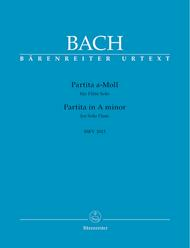 Published by Baerenreiter Verlag (BA.BA5187).ISBN 9790006447985. With introductory text. Baroque. 9x12 inches.